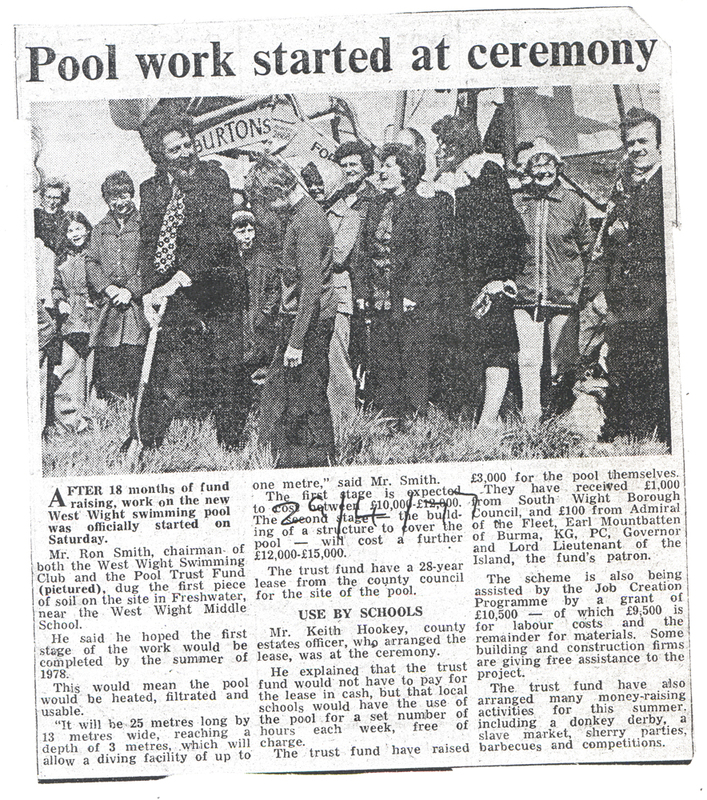 After 18 months of fund raising, work on the new West Wight Swimming pool was officially started on Saturday 23rd April 1977. Mr Ron Smith , chairman of both the West Wight swimming Club and the Pool trust fund, dug the first piece of soil on the site in Freshwater near the west Wight middle School. 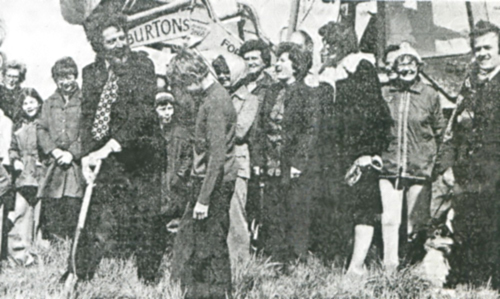 He said he hoped the first stage of the work would be completed by the summer of 1978. This would mean the pool would be heated, filtrated and usable. “It will be 25 metres long by 13 metres wide, reaching a depth of 3 metres, which will allow a diving facility of up to one metre,” said Mr Smith. The first stage was expected to cost between £10,000 – £12,000. The second stage – the building of a structure to cover the pool – would expect to cost a further £12,000 – £15,000. The Trust Fund have a 28 year lease from the county council for the site of the pool. Mr. Keith Hookey, county estates officer, who arranged the lease, was at the ceremony. He explained that the trust fund would not have to pay for the lease in cash, but the local schools would have use of the pool for a set number of hours each week, free of charge. The trust Fund raised £3,000 for the pool themselves. They received £1,000 from the South Wight Borough Council, and £100 from Admiral of the Fleet, Earl Mountbatten of Burma, KG, PC, Governor and lord Lieutenant of the island, the Fund’s Patron. The scheme was also being assisted by the Job Creation Programme by a Grant of £10,500 – of which £9,500 was for labour costs and the remainder for materials. Some building and construction firms offered free assistance to the project. 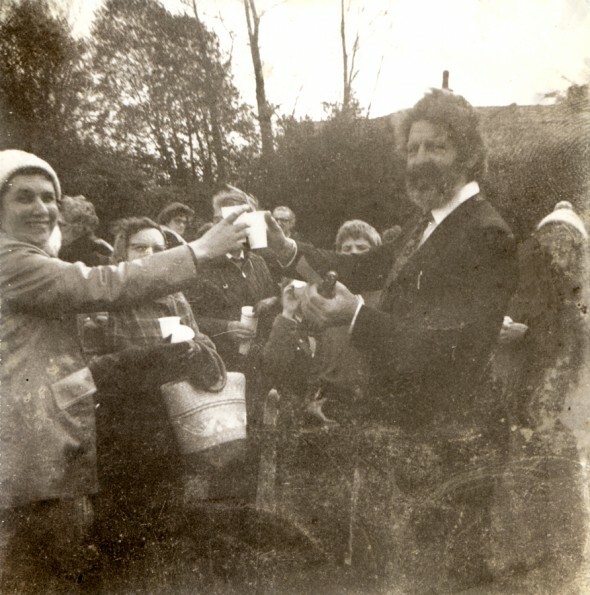 The Trust Fund also arranged many money raising activities for the summer, including a donkey derby, a slave market, sherry parties, barbecues and competitions. This entry was posted on Wednesday, March 13th, 2013 at 12:26 pm. It is filed under The Pool and tagged with Admiral of the fleet, county press, Earl Mountbatten, Freshwater, Governor, Island, Isle, Isle of wight, Lord Lieutenant, Lord Louis Mountbatten, lord mountbatten, lordPatron lord Louis mountbatten, Louis Mountbatten, Opening Ceremony, Patron, Pool, Ron Smith, Shirley Miles, Swam, Swim, swimming, swimming pool, west, West Wight Middle School, West Wight Swimming Pool, Wight. You can follow any responses to this entry through the RSS 2.0 feed.